An article by Aine Fox highlighting the situation of republican prisoner Michael Campbell, currently held in a Lithuanian jail. From the Pensive Quill. Lukiskes sits in the Lithuania town of Vilnius. If one were to walk around the exterior of the prison you may think it was part of local government buildings that inhabit the surrounding square. Instead this relic from 1904 is a notorious prison, one that even Lithuanians arrested abroad fight to stay away from. Lithuanian crime rates in EU countries have risen in the past decade but many want and fight to remain in the country’s they committed crimes in rather than be sent back to what many describe as a hellhole. Research carried out by European Committee for the Prevention of Torture (ECPT) and the European Court of Human Rights recommended Lukiskes, be shut down. Throughout it’s 107 year history the prison is infamous for torture, suicides, deaths in custody, overcrowding is prominent with sometimes more than 6 males squeezed into an average size cell. No access to regular communication, very little resources available to inmates. Michael is suffering under these conditions and has been every single day for the last 4 years. 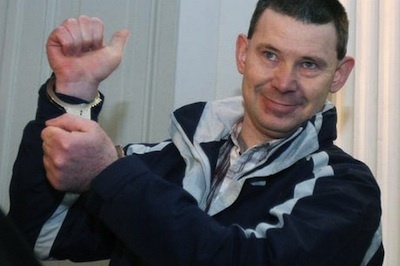 Michael was arrested in Lithuania in 2009 as part of a joint ‘sting’ operation by British Security Forces and Lithuania forces who currently remain anonymous. These “witnesses” testified by audio only during Michael’s trial. Video evidence is believed to have been tampered with, they stated that Campbell intended to buy and ship arms and ammunition to Ireland. Michael Campbell claims that these crimes were not committed of his own free will but were provoked by agents of the United Kingdom’s intelligence service, denying membership of any organization Michael feels he is a victim of entrapment. Without dissecting Michael’s case it is fair to say that there are contradictions in the state’s case against him. Michael’s brother Liam recently won a court victory and his extradition to Lithuania was ‘stayed’ due to the fact that his human rights would have been impinged had he been sent to Lukiskes or somewhere like it. (Ironic that those who run Maghaberry are opposed to regimes that impinge on human rights!! – Liam has subsequently been granted bail but is not yet released.) How do we then reconcile the fact Michael remains there? Has the wider republican movement forgotten about Michael? Is it a matter of out of sight out of mind? What can we do to show solidarity? We can all write to Michael, although he doesn’t receive his mail consistently it still will not hurt to drop a few lines to let Michael know he hasn’t been forgotten. You can sign onto a recent petition set up by friends of Michael and Liam. More importantly we can bring Michael’s case to the forefront by talking about it – questioning the reasons as to why the UK government won’t extradite Lithuanian “criminals” back to their homeland, yet it is permitted for Michael to remain there indefinitely? We need to Demand his repatriation to his home country. Solidarity and support for Michael is not about guilt or non guilt it is about remembering that he is the only Irish republican that sits in a foreign jail in despicable conditions and not enough is being done for his human rights to be respected. It is my opinion that Michael, just like Martin Corey and Marian Price amongst many others are being used as guinea pigs by a system that wants to see how much it can/will get away with – they are setting precedents that could have serious repercussions on all Irish republicans/state dissenters at home and abroad. * It has come to my attention (after I wrote this piece) that Michael has been removed from Lukiskes prison and placed within another known as “Pravieniskiu Correctional Colony”. Regardless of which facility he is heldwithin this inadequate prison system, we need to demand his rights are respected and he be returned to his home country.